The Art of Painting, also known as The Allegory of Painting, or Painter in his Studio, is a 17th-century oil on canvas painting by Dutch painter Johannes Vermeer. Many art historians believe that it is an allegory of painting, hence the alternative title of the painting. After Vermeer's Christ in the House of Martha and Mary it is the largest work by the master. 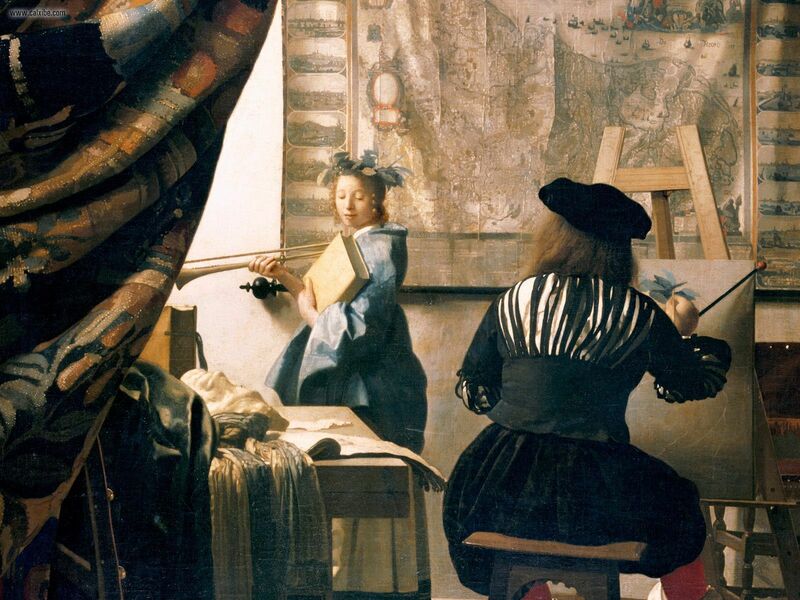 Its composition and iconography also make it the most complex Vermeer work of all. 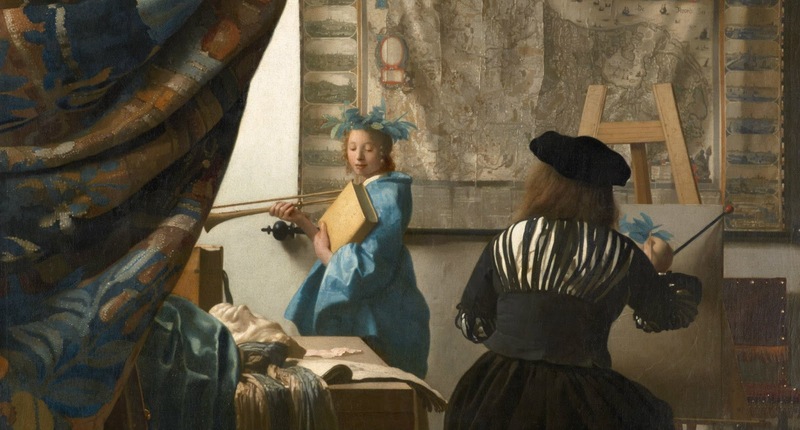 This illusionistic painting is one of Vermeer's most famous. Svetlana Alpers describes it as unique and ambitious. Walter Liedtke describes it "as a virtuoso display of the artist's power of invention and execution, staged in an imaginary version of his studio .".. According to Albert Blankert "No other painting so flawlessly integrates naturalistic technique, brightly illuminated space, and a complexly integrated composition". 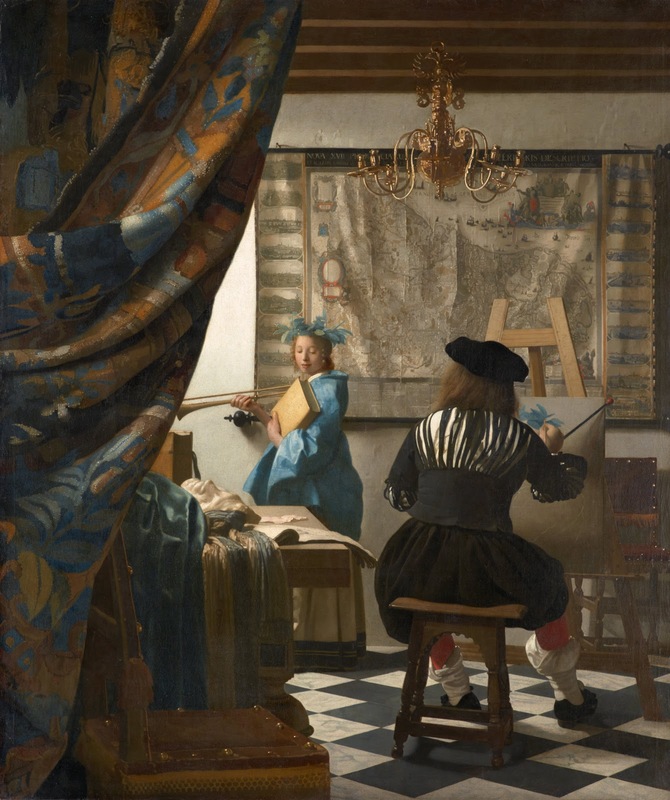 The painting depicts an artist painting a female subject in his studio, by a window, with a large map of the Low countries on the wall behind. 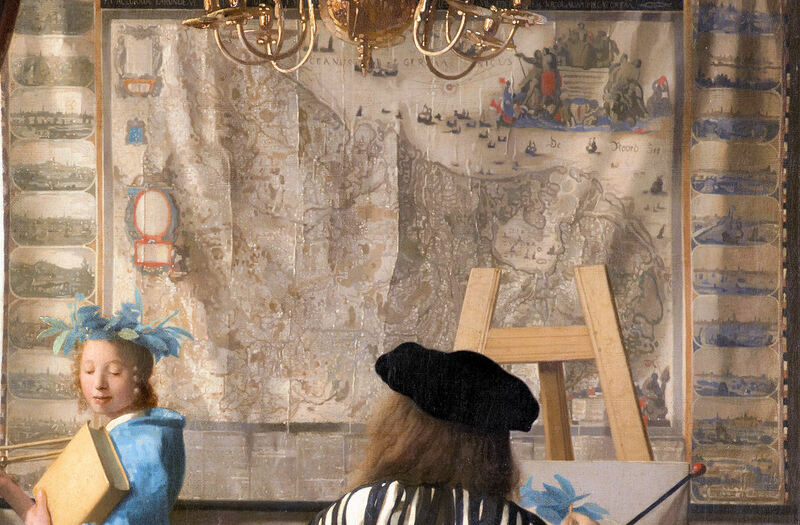 Vermeer signed the painting on the map, behind the model's neck, but did not date it. Most experts believe it was done between 1665/1668, but some suggest the work could have been created as late as 1670-1675. 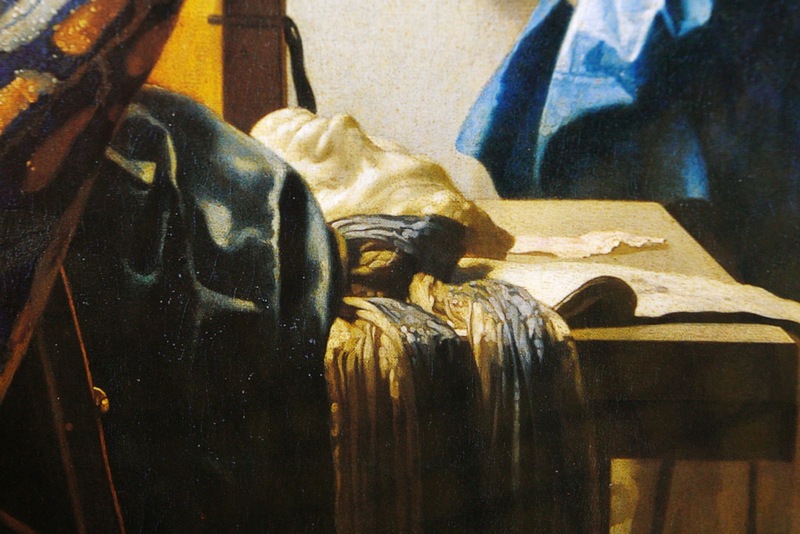 In 1663 Vermeer had been visited by Balthasar de Monconys, but had no painting to show. It was possibly done "in order to have an outstanding specimen of his art in his studio". 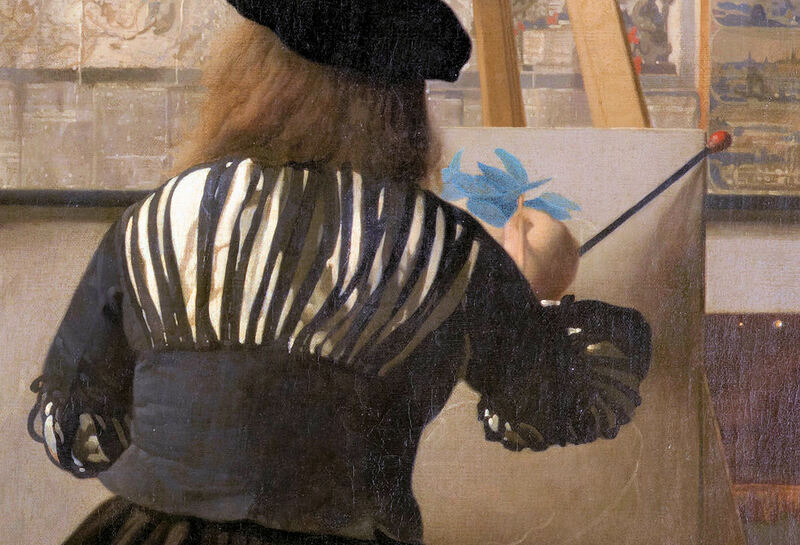 Vermeer obviously liked the painting; he never sold it during his lifetime. It stands as a kind of summary and assessment of what has been done. The painting has only two figures, the painter and his subject, a woman with downcast eyes. The painter is thought to be a self-portrait of the artist and according to Jean-Louis Vaudoyer the young girl could be his daughter. The tapestry and the chair, both repoussoirs, lead the viewer into the painting. As in The Allegory of Faith the ceiling can be seen. 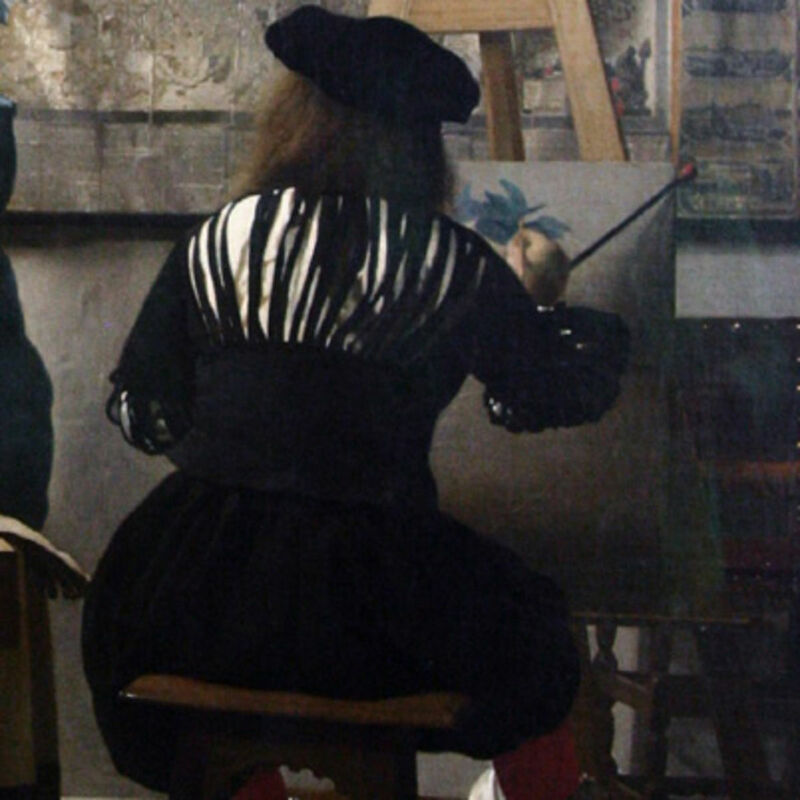 Vermeer had a theoretical interest for painting. A number of the items, a plaster mask, perhaps representing the debate on paragone, a piece of cloth, a folio and some leather on the table are thought to be somewhat out of place and uneasy to explain. The marble tiled floor and the splendid golden chandelier are examples of Vermeer's craftmanship and show his knowledge of perspective. The map in the background is of the Seventeen Provinces of the Netherlands, flanked by 20 views of prominent Dutch cities. In the top left two figures of the map two female figure can be seen; one bearing a cross-staff and compasses, while the other has a palette, brush and a city view in the hand. Painted ships sail over the folds. It was published by Claes Janszoon Visscher in 1636. This map, but without the city views on the left and right can also be seen on paintings by Jacob Ochtervelt and Nicolaes Maes. Similar maps were found in the Bibliothèque Nationale in Paris and in the Swedish Skokloster. Experts attribute symbols to various aspects of the painting. The subject is supposed to Fama, Pictura or Clio, the Muse of History, evidenced by her wearing a laurel wreath, holding a trumpet, possibly carrying a book by Herodotus or Thucydides, which matches the description in Cesare Ripa's 16th century book on emblems and personifications titled Iconologia. However according to Ripa History should look back and not down as in this painting. Following Vermeer's contemporary Gerard de Lairesse, interested in French Classicism and Ripa, there is another explanation; he mentions history and poetry as the main resources of a painter. The female in a blue cloth and with a trumpet and the laurel could also be representing poetry. Plutarch observed that "Simonides calls painting silent poetry and poetry painting that speaks" (later paraphrased by the Latin poet Horace as ut pictura poesis). The painting is considered a work with significance for the artist because the painter himself did not part with it or sell it, even when he was in debt. In 1676, his widow Catharina bequeathed it to her mother, Maria Thins, in an attempt to avoid the sale of the painting to satisfy creditors. The executor of Vermeer's estate, the famous Delft microscopist Anton van Leeuwenhoek, determined that the transferral of the work to the late painter's mother-in-law was illegal and according to John Michael Montias at least a curious transaction. Most of his paintings were then sold in an auction at the Guild in Delft, 15 March 1677. It is not known who bought the Art of Painting; it is believed it was Jacob Dissius. The painting was owned by Gottfried van Swieten, and passed into the hands of his heirs. In 1813 it was purchased for 50 florins by the Bohemian-Austrian Count Rudolf Czernin. It was placed on public display in the Czernin Museum in Vienna. Until 1860, the painting was considered to be by Vermeer's contemporary Pieter de Hooch; Vermeer was little known until the late 19th century. Pieter's signature was even forged on the painting. It was at the intervention of the German art historian Gustav Friedrich Waagen that it was recognised as a Vermeer original. In 1868 Thoré Bürger regarded this painting as his most interesting. In August 2009 a request was submitted by the heirs of the Czernin family to Austria's culture ministry for the return of the painting. A previous request was submitted in 1960s however it was "rejected on the grounds that the sale had been voluntary and the price had been adequate". A 1998 restitution law which pertains to public institutions has bolstered the family's legal position. L'Allegoria della Pittura è un dipinto a olio su tela (120x100cm) di Jan Vermeer, databile al 1666 circa e conservato nel Kunsthistorisches Museum di Vienna. È firmato sulla carta geografica a destra della ragazza "I[oannes] Ver. Meer"
L'opera è documentata fin dal 1676, quando il 24 febbraio venne ceduto dalla vedova dell'artista, Catharina Bolnes, alla madre in risarcimento di vari debiti. La donna voleva forse salvare dall'imminente vendita all'asta dei dipinti del marito questa opera, chiamata "L'arte della pittura". Opera di dimensioni eccezionalmente grandi, era forse una sorta di testamento spirituale dell'artista. Nonostante ciò un anno dopo Maria Thins notificò come l'opera fosse inclusa nella liquidazione fallimentare all'asta di tutti i beni della famiglia. 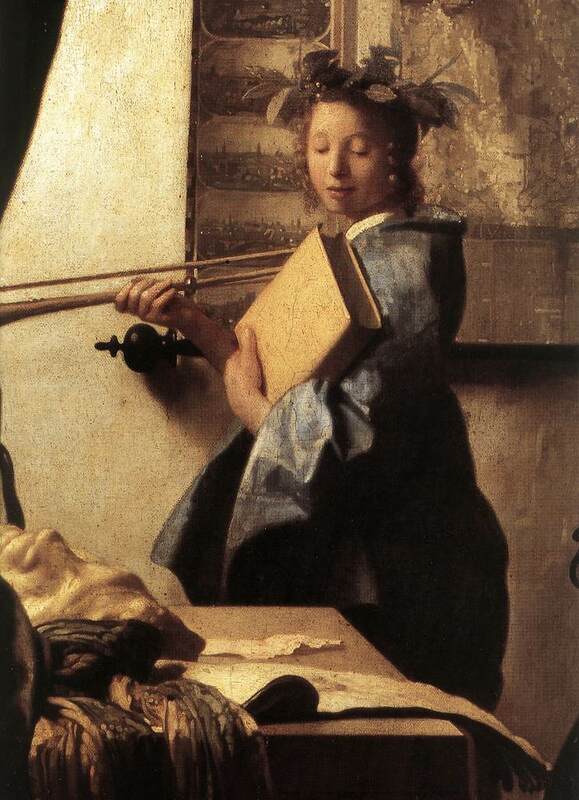 Non si può stabilire con certezza se il dipinto è quello citato nell'asta Dissius del 1696 come "Ritratto di Vermeer in una stanza con vari accessori". Il dipinto scomparve poi fino al XIX secolo, quando lo si ritrova nelle collezioni Gottfried van Swieten e del conte Czernin. Nel 1938 entrò nelle proprietà di Adolf Hitler, e solo nel 1946 passò al museo viennese. L'opera è variamente chiamata con titoli convenzionali, come anche il Pittore e la sua musa o l'Atelier. 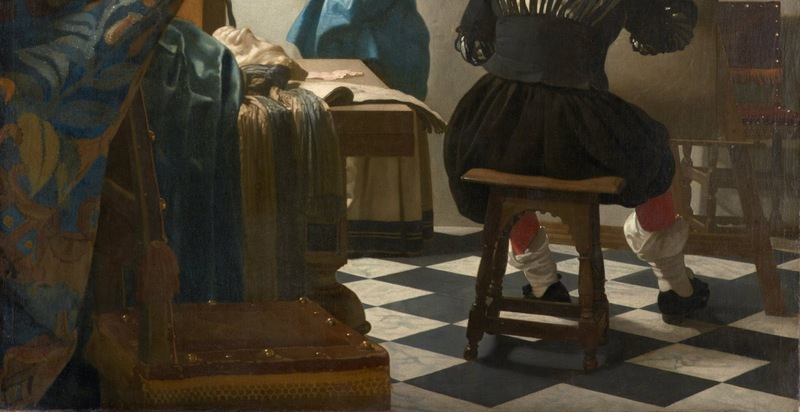 Rappresenta un pittore rivolto di spalle, forse lo stesso Vermeer mentre sta dipingendo una fanciulla all'interno di una stanza illuminata da sinistra da una finestra nascosta da un drappo scostato in primo piano. La ragazza tiene in mano un libro (simbolo della Storia) e una tromba (simbolo della Gloria) e ha in testa un serto di alloro: forse rappresenta la musa Clio. Il pittore sta seduto davanti al quadro sul cavalletto, dove si vede già lo schizzo della corona. È vestito con un elegante abito nero con tagli sulle maniche e sulla schiena che fa intravedere la camicia sottostante. Ha corte braghe a sbuffo e calze arancio, un capo costoso e di moda che si ritrova anche in altre opere dell'epoca, come in un noto autoritratto di Rubens. Non rivela il proprio volto, ma idealmente l'artista si mette nello stesso punto di vista dello spettatore. La stanza è descritta come al solito con estrema cura. La tenda scostata, istoriata come si trova in altri dipinti dell'artista (l'Allegoria della Fede cattolica o la Lettera d'amore) rivela un ambiente scorciato in prospettiva con piena padronanza spaziale, come dimostrano il pavimento piastrellato o le travi del soffitto. A sinistra si vedono un baule borchiato in penombra e il tavolo presso il quale sta la fanciulla, sul quale si trovano dei drappi, fogli e altri oggetti che alcuni hanno messo in relazione ai simboli delle Arti liberali, con riferimento alle illustrazioni dell'Iconologia di Cesare Ripa, tradotta in olandese nel 1644. 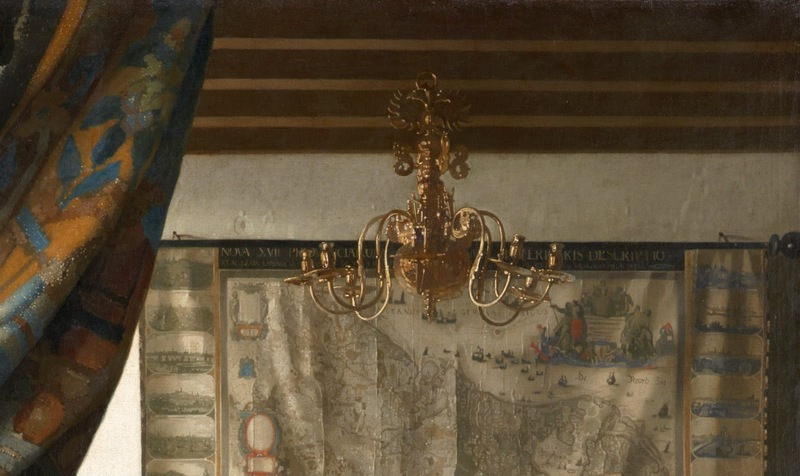 Sulla parete di fondo sta una grande cartina geografica delle Diciassette Province (prima della separazione del 1581) a forma di "Leo Belgicus", che appartenne alla casa dello stesso Jan Vermeer. Notevole è la rappresentazione della luce su di essa, mossa da lievi increspature. Poco sotto una sedia ricoperta di velluto. Ciascun oggetto riflette o assorbe in maniera diversa la luce, ottenendo la più accurata resa degli effetti materici. Ne è un esempio lo straordinario lampadario metallico appeso in alto, in cui si legge tutta l'eredità dei primitivi fiamminghi come Jan van Eyck: non è dissimile infatti da quello nel celebre Ritratto dei coniugi Arnolfini.